A luxe eco-compact. 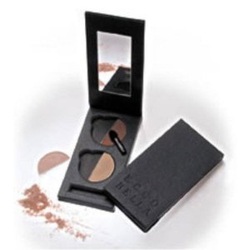 Choose the cosmetic colors you want and mix & match them in this portable compact. Tiny magnets hold the eyeshadow, eyeliner, and blush in place only as long as you need. Replace them with fresh new colors, and keep the compact until it's ready to be recycled. "A luxury eco-compact made of paper. Buy the compact empty, choose the eyeshadows and blush colors you want." See the next page for more great Ecco Bella cosmetics for the Eyes, in addition to MyChelle eye-shimmer sticks - both natural, and fragrance-free!